Somewhat crappy summer aside, I have a nice little beer in front of me tonight. Introducing Mt. 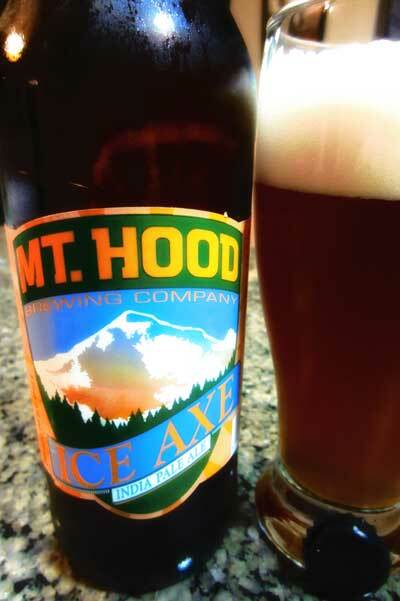 Hood Brewing Company‘s Ice Axe IPA (5.7% ABV). According to the label and website, it is their Flagship Ale, in fact. As noted on the label, it is a British-style IPA… which made me take a look at the interwebs to ensure I had my IPA facts right. British-style is meant to be “bitter yet smooth” according to the Inside the Cooler at www.oregonlive.com. Well, Mt. Hood Brewing Company, I think you nailed it. For the taste: nice big frothy head (if you give it enough aeration), no nose (will get to that in a moment), nice golden color, light body, lightly hoppy finish. Reminds me of a mix between a traditional scottish, a british, and an IPA. Really good. My only, only complaint from keeping this in the upper eschelon of light IPAs… the nose… nearly no aroma. If it were added, you can’t tell… maybe a little too early in the boil? Maybe no dry hopping? Either way, this beer needs a nose. That is it, though. Other than that, this one stands out in the land of Northwest IPAs… the style is refreshing. More of a session IPA. But in a good way. I do have to say the website is a bit lacking… and the site isn’t in sync with the label. On the site it notes this as a “satisfying strong pale ale”. I would keep it to the label language, “exeptional example of a British-style IPA”. That is how you market this beer. Don’t try to compete with the big Northwest IPAs… keep this one simple. It is a light, smooth IPA that is a perfect introductory IPA for those that fear the hops! This entry was posted in India Pale Ale, Mt. Hood Brewing and tagged British-style, Ice Axe IPA, IPA, Mt. Hood Brewing Company, Will Buy Again. Bookmark the permalink.